We know surprisingly little about UK Little Owls, despite the fact that they were introduced here over a 100 years ago. The UK Little Owl Project was set up in June 2015 by conservation biologist Dr Emily Joáchim, with the kind assistance of Andy Rouse Wildlife Photography. Emily is passionate about raptors and researches UK Little Owls. 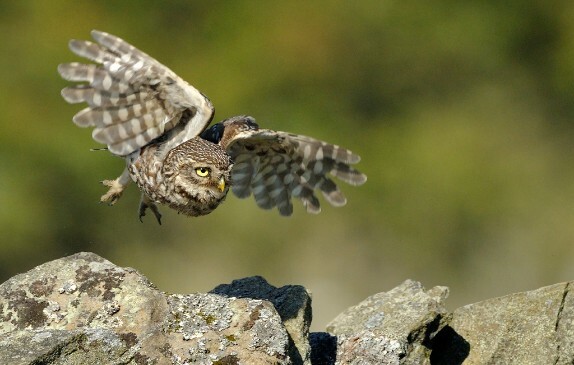 We aim to further our understanding of the Little Owl's ecology in the UK. We want to support, develop and promote new and existing UK Little Owl research projects. This includes projects that monitor Little Owl nests, record biometrics, habitat use, diet, vocalisations and juvenile survival rates. We're keen to support projects which survey for UK Little Owls. We have set up a UK Little Owl sightings project and we will share data with relevant bird organisations and county wildlife groups. The Little Owl is a much loved bird in the UK. We will provide you with advice on how to support your local Little Owls, including how to install and maintain Little Owl nest boxes and habitat management advice. We would like to develop resources to help standardise UK Little Owl monitoring projects. This includes downloadable guides on nest boxes, how to study Little Owl diet and monitoring nest sites. Information will be shared via our blog and Twitter feed (@UKLittleOwls). Emily is currently monitoring a Little Owl nesting attempt using a nest box camera. Please follow our blog for her regular updates. Why focus on UK Little Owls? We do not presently know why the Little Owl is in rapid decline in the UK. Emily runs this project as a volunteer - please contact us if you might be able to fund a salary or are interested in sponsoring the UK Little Owl Project.